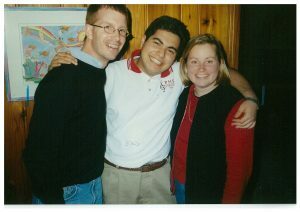 During their FLEX year many FLEX students – turn alumni, develop friendships that last for years or decades afterwards. 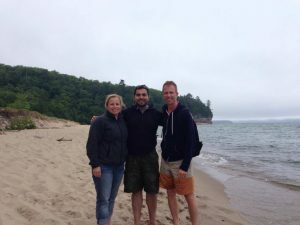 Returning to their home countries, they share stories about their host families, friends, and American experiences in their communities and serve as unique links between two very different cultures. But they also bring change to families and communities in the U.S. that afterwards feel connected to countries about which they had known very little before. Emil Gafarov’s ’02 story is a great example of how his cultural exchange continues to benefit both sides more than fifteen years after his FLEX year. 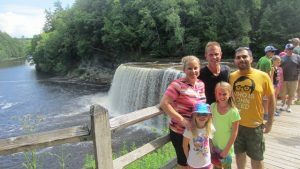 For the first time the FLEX Alumni website shares a story from two perspectives, Emil’s and his host parents’, highlighting the experiences of being an exchange student and a host family. Emil: I’ll never forget leaving Baku. It was my first time traveling internationally and such long distance all at once. 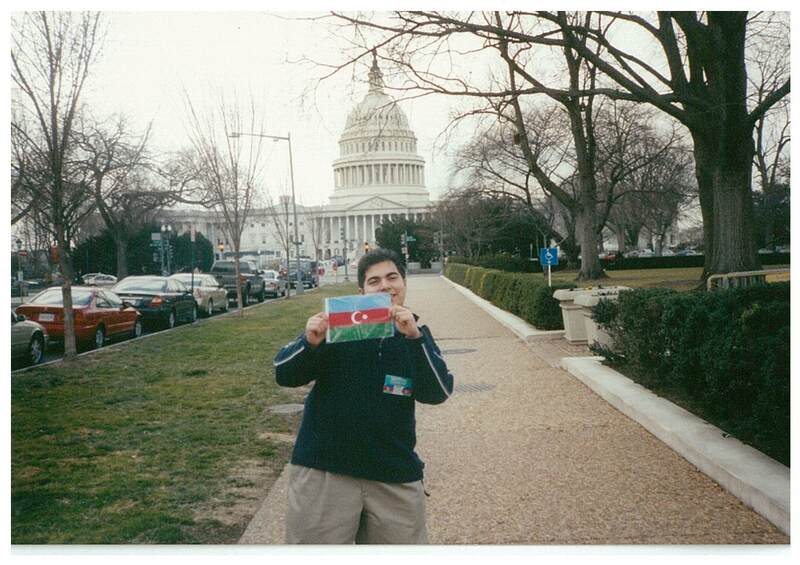 When I arrived to the U.S., I stayed with my Local Coordinator for a while. I began going to school and looked forward to my permanent placement. In early October I went on a camping trip ‘Trees for Tomorrow’ to North Wisconsin and when I got back, I learned that Marty and Paula Krause, my high school teachers, had decided to become my American family. They accepted me from the very beginning and I got used to living with them very quickly. Marty: By that time Paula and I had been married for about 4-5 years and didn’t have our own kids yet. Emil was a student in my class, but I didn’t know much about his personal situation. During a parent-teacher conference his Local Coordinator came to talk about his grades and mentioned that he didn’t have a permanent family to stay with. When I got home, I shared the news with Paula and we both felt like we needed to offer our home to him. It was a big step for us, because at the time we were just thirty and had only been used to each other’s company. Paula: I had been a foreign exchange student in Colombia myself and this experience influenced me a lot. I was very well aware of what it was like being an exchange student. Knowing that Emil didn’t have a permanent family in the U.S. made me sick to my stomach. A few days after we agreed to host him, Emil moved in with us. It was pretty instant! Emil: The Krauses were extraordinary in everything – in understanding, helping, and caring. They supported me whenever I felt homesick or had a bad day in school. Once, for example, I received a bad grade in Math and felt awful about it. When Marty and Paula knocked on my door asking me to help out with dinner preparation, something we usually enjoyed doing together, I said that I didn’t want to do anything. They then invited me to the living-room and we had a chat. I shared my troubles with them, they gave me a hug and I immediately felt much better. For me that meant so much. But it wasn’t just the three of us – I immediately developed relationships with my American grandparents, uncles and aunts. I couldn’t have wished for a better family! Marty: Emil was very well-suited to be an exchange student. He was so easy to get on with and was so interested in learning about us and American culture. Of course the role of parents was new to us and we didn’t know how to handle lots of situations. 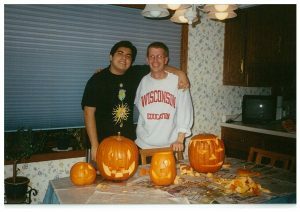 I was probably much more immature at the time and regarded him more as a little brother than my child. Paula: We tried to respond to his behavior and comfort him when he felt homesick. A couple of times I noticed him missing his family back home and so I got him on the phone with his Mom. Even though I couldn’t speak to her directly because of the language barrier, there was an understanding between us that Emil was in good hands. Emil: In January Paula had to have a surgery. They announced it one night over dinner in a restaurant. Embarrassingly, when I found out, my first thought was: ‘I’ll be moved away from them and they won’t be my host parents anymore’. I was so scared. But when they started talking about only temporarily moving me to Marty’s brother’s house, I was surprised and asked them: ‘Does that mean I can stay?’ They looked very surprised and said: ‘What do you mean? Of course you’ll stay with us. We’re just organizing your schedule differently for a couple of days’. I’ll never forget the day when Marty brought Paula home from a hospital. He took such great care of her. Living with this young family, I learned a lot about love and what it means to be a devoted husband or wife. This knowledge has influenced my relationships with people greatly. Sometimes I even joke with Marty: ‘What have you done? You taught me too much about the importance of being a good person’. Marty: I remember that night in a restaurant. Earlier that day we went to the doctor and found out that Paula needed to be in a hospital for a while. We knew that we’d figure out the best plan of action with Emil’s schedule in mind and wanted to share it with Emil straight away. But when we told him about Paula’s surgery, he looked mortified – and we couldn’t understand why. Paula (laughing): I thought he was worried about me and kept saying: ‘Don’t worry. It’s not too serious – I’ll be alright’. Marty: Eventually, when we started discussing our arrangements, he asked: ‘Does that mean I can stay?’ It hadn’t for a second occurred to us that we could part with him. By that point he was family to us. Emil: There were so many happy moments – lots of fun trips and family holidays. I went to various places and my host family even helped me to raise funds for my trip to Disney world with my Placement Organization. But the memory that comes to me most often is seeing the Northern Lights with Marty and Paula. One night a neighbor called and told us to go outside immediately. We rushed out of the house, even though I was confused at why we had to. But when I looked at the sky, I couldn’t believe my eyes. The colors of the sky were so breathtaking that I felt really happy. I just stood there hypnotized, having forgotten about everything else in the world. Paula: I wanted to make sure that we took Emil to as many places as we could. We took a trip to Chicago during winter break and had a lot of fun there. We were constantly looking for opportunities to share our culture and introduced him to American traditions. We even carved pumpkins at Halloween together – something the two of us hadn’t ever done before. Emil really immersed himself in our extended family as well and now when he’s coming back for a visit, everyone is very excited to see him. Emil: After my FLEX program we didn’t see each other for the next ten years and continued our relationship through email and social media. In 2007 and 2009 my host sisters, Ruthie and Anna, were born and in 2011 Marty and Paula told me that it was time for us to reunite. When Marty brought me home and I met the girls and saw Paula, I felt very emotional. The family dynamics, of course, were then very different, but I was still a part of their family. More stable at my job, I’ve started visiting them more regularly and now the girls are completely used to me. They tell me stories, we play games, and even perform piano pieces together. I hope that one day, when the girls are a little bit older, the whole family will come to Azerbaijan to visit me. Paula: When Emil came back to visit us, it felt as if he’d never left. I think we’re so used to his flexibility that we’re now taking it for granted. We expect him to be comfortable with us and our routine. 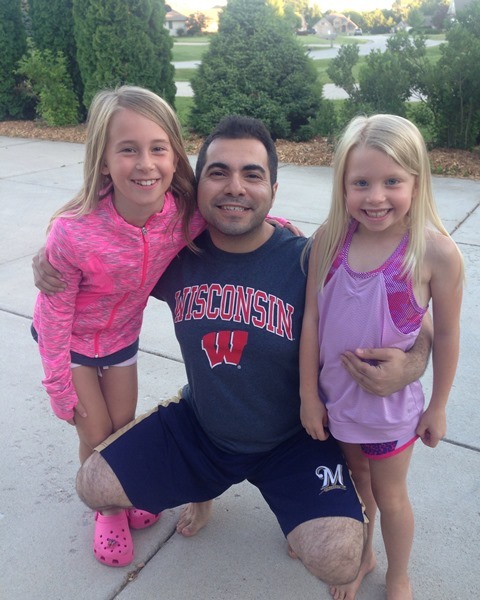 Last summer he was sharing his musical talent with the girls and it made me very happy. Now they’re even more motivated to continue studying piano. And I think it meant a lot for Emil as well. I could see that it was difficult for him to leave the chaos of our family. Emil: My natural family is very grateful to the Krauses. My natural mom often tells stories about my trips to the U.S. to her colleagues and friends, referring to my host family members as ‘Emil’s Mom, Dad, and sisters’. I have used the generosity and kindness of my host family as a model for building my own life. The world nowadays is in a critical state and intercultural understanding is very important for the future of our planet. The FLEX program allows people to understand that differences in cultures and religions shouldn’t prevent us from being friends. I can’t possibly overestimate its importance. Marty: Now we’re connected with the part of the world where Emil comes from. Fifteen years ago I didn’t know where Azerbaijan was on the map and now we tell stories about its culture to our students. During the Olympics we’re excited to see the team from Azerbaijan compete and we also pay attention to the news from Emil’s region. The religious aspect is important as well. Emil is the first Muslim that I got to know closely and it has been wonderful learning about his religion and traditions. 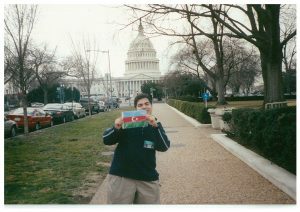 One day we would love to visit Azerbaijan and meet his natural family!